Get unlimited local and long distance calls in USA and Canada + FREE international calling to more than 60 countries, inlcluding Republic of Georgia! Check out this is unique offer from VONAGE. I use it myself for about 3 months already, call to Georgian land line phones and talk for hours without paying a penny for internationall calls. What is most important - I am very happy with VONAGE quality. You won't regret too! Georgian Genealogy - a webbased company that does research of Georgian surnames history per your request. Georgian Genealogy is using all available sources: old archival records; from XIX c. - registers of births, marriages and deaths (parish and civil registers), census lists, etc. Also, they study special literature, information on history and origins of Georgian last names. 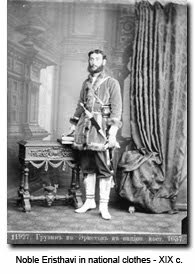 Georgian Genealogy website has publicly available information concerning history of Georgian surnames, usefull bibliography, information about main nationalities in Georgia. Here you could find interesting information about Georgian surnames in historic sources, Description of Georgian Kingdom by Vakhushti Batonishvili. The list of the nobility of the Qarthl-Kakhethi kingdom of 1783 Georgian Antiquities. The Tbethi Synodal Records. The Charters of Blood. Historic documents. The Chronicles and other materials about Georgian history and writings. Preserved by its long isolation, the Upper Svaneti region of the Caucasus (Georgia) is an exceptional example of mountain scenery with medieval-type villages and tower-houses. The village of Chazhashi still has more than 200 of these very unusual houses, which were used both as dwellings and as defence posts against the invaders who plagued the region. The study of the cultural legacy of Svaneti through the excavation, reconstruction and interpretation of its physical remains is led by a special expedition of the Center for Archaeological Research of the Academy of Sciences of Georgia, which has already brought to light over 200 significant artifacts from the Neolithic, Bronze, Greco-Roman and Middle Ages; mining and metallurgical complexes; structures erected for cult worship, defense fortifications, burial sites and living settlements. In the course of these excavations there have been discovered several thousand examples of artistic handicraft work, the product of various epochs, which clearly show the key roles which the natural environment of the mountains, its flora and fauna, and domesticated and wild animals played in the religious cult of the Svanetians. These handicraft wares at the same time reveal vital information regarding the exploitation of natural resources by the local populace, the development of ancient metallurgical engineering processes, artistic tastes, and trade capabilities in the region. These materials are routinely processed and analyzed at the on-site storage center for the expedition in Svaneti (Mestia Settlement). William O. Field (1904 - 1994), geographer, pioneer glaciologist, and a member of the American Geographical Society visited the Soviet Union three times between 1929 and 1933. 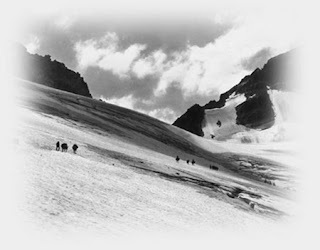 During his first trip in 1929, Field traveled to Svanetia, a remote region in Georgia, located in the southern part of the Central Caucasus. 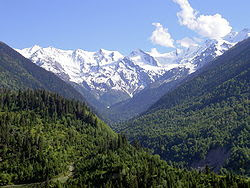 His photographs capture the beauty of some of the highest Caucasus mountain peaks, such as Ushba, Tetnuld, and Shkhara. Field also became interested in the people of the region and documented their life as well as historical churches, towers, and settlements in Svanetia. He returned to the Soviet Union in 1931 and 1933. In addition to visiting Georgia, Field also traveled to Moscow and other Russian cities taking photographs of historical buildings and May 1st celebrations. In 1933 he visited remote areas of Dagestan taking pictures of hillside villages and the Dagestani people. Images of Caucasus Region 1929-1933 presents over 700 images of Russia and the central Caucasus including the Republic of Georgia and Dagestan from the William O. Field Collection housed at the American Geographical Society Library. The photographic collection is supplemented by Field's diaries and travel notes, and a selection of maps of the Caucasus region. In the men's final match the same teams of European Team Championships held in Minsk 2007 were on the tatami. Winner was just like in Minsk, Georgia against France. The French had a great start. In the category -66kg, European Champion Sofiane Milous met David Asumbani who was few month's earlier the winner of Grand Slam Tournoi de Paris. Milous threw ko-soto-gake, scoring an ippon. Varlam Liparteliani (GEO) confirmed his quality and good form in his match clashing with bronze Romain Buffet. Liparteliani threw an amazing uchi-mata for an ippon and finally won his gold, but this time with the Georgian men's team. Georgia's final team: David Asumbani (-66kg), Zaza Kedelashvili (-73kg), Levan Tsiklauri (-81kg), Varlam Liparteliani (-90kg), Lasha Gujejiani (+90). French final team: Sofiane Milous (-66kg), Loic Korval (-73kg), Antoine Jeannin (-81kg), Romain Buffet(-90kg), Teddy Riner (+90).